I am very grateful to be here with you. It is always a highlight of my year to come to Anand Prakash Ashram, simply because Sriman Param Pujya Vishwaketuji Yogi is always so hospitable, kind and so spontaneously affectionate to us. It is the goodness of Vishwaketuji Maharaj’s heart that has manifested in this ashram, and I am always so happy to meet all of the fortunate students that come here on the banks of the holy River Ganga. Thank you very much. 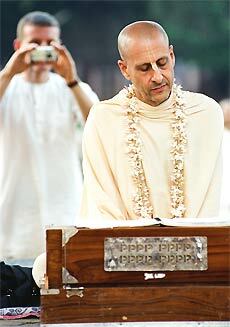 Anand Prakash means ‘the divine revelation of ecstatic happiness’. The Acharyas are great spiritual teachers who have explained different types of happiness: two words are sukha and ananda. Generally, the concept of sukha, which means happiness, is the other half of another word dukha, which means misery. Sukha-dukha means happiness and distress. They are two parts of the same principle of duality, because the entire material creation is built on the principle of duality. There is light and there is dark, happiness and distress, honor and dishonor, pleasure and pain, success and failure, victory and defeat, health and disease, birth and death. In the Bhagavad-Gita Krishna describes this world as dukhalayam ashashwatam. Dukhalayam means the place where inevitably there is suffering. Why is that? Because the atma, the living force within us is sat-cit-ananda. Sat means we are eternal, cit means we are full of divine knowledge and ananda means we are naturally blissful. In the school of bhakti we understand that the source of that blissful nature is experiencing the infinite love of Krishna or God. When that love awakens within our heart, we naturally realize that every living being is a part of God, everything that is in existence is a gift of God, and therefore there can only be love radiating from our souls. “Please wake-up souls, wake up! You are sleeping in this illusion and in this illusion you are constantly in the presence of these dualities.” Every pleasure in this world is very limited in quality and quantity, and it has an end. Eventually it is dukhalayam, it is distress. We love someone in this world, but we know they are going to die or else we are going to die. We both are going to die and all our friends are going to die – just for some consolation – all our enemies are going to die too, by the power of time. Therefore, we can’t hold onto anything. It is human nature that when we find something that gives us some happiness and pleasure, we become attached to it. We want to hold onto it, but we cannot hold onto anything. Did you ever try to hold onto time? I can hold onto this clock, and even if I take the battery out, I am still going to get old and the sun is still going to rise and set in horizon. We can’t stop time. It is so subtle: you can’t see it, you can’t taste it, you can’t touch it, you can’t hear it and you can’t feel it. But it so powerful! Everything within mortal creation is under its control: armies cannot subdue time, even the greatest scientists, even the greatest scholars cannot stop time for even a moment. Therefore everything is in this temporary state. I remember. When I was little boy, there was one famous movie actress- I’m not going to say her name out of respect- she was really beautiful. I was just a little boy and I didn’t really know what all this romance was. But later on I became swami, and I just happened to see in the newspaper that that same person tried to commit suicide several times and was living in seclusion. Because she was getting so much pleasure out of being beautiful, so many people would see her with her beauty and be attracted, but now she was old and nobody cared about her beauty anymore and she didn’t want people to see her like that. She did surgeries and she had all kinds of cosmetics, but there was nothing she could do. Beauty is only skin deep. About wealth, there is a saying in India that in the cremation ground, before they burn you, they put a white sheet on you and it’s explained that whether you were living as a little villager or whether you were a crorepati or a billionaire, there are no pockets in the clothes they put on you in the cremation ground. That’s actually a very philosophical truth. You can’t take anything with you: you can’t take your PhDs, you can’t take your platinum records, and you cannot take your popularity, or your skills, because everything is under the influence of the ever-changing time. Time is like the Ganga. It is always flowing, but you can put a dam on it. On the surface of mother Ganga there are so many ripples, and so many swirling, and so many different things that are floating around. On a rainy day it’s flowing gushingly and on a sunny day it is just flowing calmly. And in the winter it’s crystal clear and blue water and later on in the path it starts getting muddy because things start melting and then people start throwing. This is the message of the Lord: whether you are a family person with a husband or with a wife, with children and taking care of parents, grandparents, having a job, paying the mortgage, paying taxes, a working person or whether you are yogi living in the Himalayan caves, or whether you are a Swami, traveling around… I was speaking this morning that usually every year I’m invited to HSBC bank to give a lecture at their headquarters in London, and I’m always fascinated by that because there’s usually about 900 bankers sitting there and I haven’t had a checking account or a bank account or signed a cheque since 1969. And when I told them that, they looked at me like I was an alien from outer space….. So whether we are swami just traveling around or whether we are millionaires and billionaires or family people, it doesn’t matter. To a person who experiences this higher realization, the pleasures and the pains of this world are not that much different. She said, “Krishna let challenges, calamities, and difficulties come again and again because in those challenges I have no one else to turn to except you!” The pleasures of this world can sometimes make us very complacent and distracted, and the pains could do that too. So rather than being attached to pleasure or pain, in this wonderful opportunity that we have we can become attached to anand prakash, to the revelation of ecstasy of love. 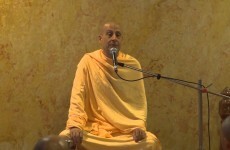 Bhaktivinod Thakur explains that this chanting of God’s names, this kirtan, harinam karo re, actually tunes us into that ananda, to the ecstasy, to the love of the soul. Unfortunately in this world, because people are so much asleep to their true nature, they are thinking that by acquiring more and more things or by getting more power, more fame, by somehow or other feeding our ego to think ‘I’m superior to others,’ and proving it, and in the process usually causing so much pain, we think that’s going to make us happy. There’s a traditional analogy. That type of happiness is like, if you come to the Ganga… It used to be that way that the government would punish people, they would take them by the hair and bring them to the river and pushed her head down and keep it down underwater. Every breath is so precious. Since I began this talk how many times do you think you inhaled and exhaled? But we take it for granted so much that we don’t even think about it. But if you are underwater for about a minute and they are holding you down there, you would give everything you have for a breath. It is like that with our relationships too. Often times we don’t appreciate people until they are dead. ‘Oh! I should’ve done this and I should’ve done that’. What to speak of breathing! There’s a famous saying that- the youth is wasted on the young. When we are young and we can get so much done and we have so much energy, usually we waste it because we don’t understand the value of it. And when we are old and it’s too late, we think, “If only I was strong again, I would do this and that.” So this person is under the water and he is really, really just struggling, struggling, struggling, and then they put his head up and ahhhh! And you know how good it feels when you breathe. And you get a few breaths and put underwater again. Sukha-dukha happiness and distress: there is the pleasure of breathing and the stress of being put underwater. There is something more in life than that. There is ataho brahma jignyasa. There’s the opportunity for ananda, for real happiness. And when we connect to that real happiness within ourselves, we have something really wonderful and valuable to share with the world, and that’s what yoga really is meant for. The science of yoga is meant to bring us to that of awakening, and then we have something so beautiful so wonderful to give. How many of you have read or heard the story of Mahabharata? Please raise your hands. Well, I am going to tell a little story. The Pandavas were the rightful kings, the sons of Kunti. They had a cousin brother Duryodhana, who was envious of them and wanted the kingdom for himself. Everyone loved the Pandavas and no one liked Duryodhana, because he was such an envious person. He was always plotting and scheming against them, and his idea was, by putting them down he will put himself up. But the more he would try to put them down, the more people didn’t like him, and he couldn’t tolerate that. People liked them instead of him. So ultimately he was doing all these terrible things of making plans and conspiracies to kill the Pandavas. And his uncle Vidura was always trying to convince him and his father Dhritarashtra to be fair to the Pandavas. But Dhritarashtra was much influenced by his son. He knew his brother Vidura was saintly and was giving him good information. But every time he tried to follow what Vidura would say, Duryodhana would become really upset, and he would say, “Unless you do what I want, I am going to commit suicide, and it’s your fault.” Father was attached to his son, and so he always sided with Duryodhana, who was doing those atrocities. One time Vidura was so compassionate, he was telling his brother Dhritarashtra, “Your son is envy personified, and if you follow him, everything is going to be ruined. Yudhishtir and the Pandavas are pious people. Why are you torturing them? Why are you cheating them?” And he said it in the presence of Duryodhana. Duryodhana was so angry. He said to Vidura the nastiest words to insult him. I’m not going to go into detail, because it will take a really long time. But Duryodhana just started insulting Vidura’s mother for the caste that she was born in. He called her, kept maidservant, and “You are the son of such a woman.” This is his nephew speaking. It is described in the Bhagavat Purana, that Duryodhana was insulting Vidura so terribly, that his words were like the sharpest fiery arrows that were going right into the Vidura’s heart; and when your own relatives speak in that way in public, it hurts. And then Duryodhana said, “I exile you from this kingdom. You leave this town and I will not allow you to take anything with you, except the breath you breathe.” And Duryodhana, because his father was the King, he was meant to give the kingdom to Yudhishtir, but he wanted. King was keeping it for his own son. He had all the military. So, Vidura, who had a wife and a home and the family, he just had to immediately leave and take nothing with him. He was insulted, he was humiliated and he was literally impoverished. But as he was leaving, there was sadness in his heart for his brother, because he was being misled. Even though Vidura was the most loving, supportive brother anybody could ever be, Dhritarashtra, his brother, didn’t say a word to defend him. He let his son go on insulting him and exile his own brother. So, Vidura left. He was totally betrayed. We know, in this world, the greatest, most traumatic pain of the heart is, when we are betrayed by someone we love and trust. I’ve seen betrayal can bring such deep depression and even disease. He was betrayed. But Vidura was a yogi. As he was walking away, he was thinking that, “This is the greatest blessing I have ever got in my life. I can just go on pilgrimage. I’m free. I’m liberated. I tried my best to end all these conspiracies of envy and hate but now I’m free to just travel and wander to holy places and give my whole heart to God and chant His holy names and meditate on him and pray to him.” In the Bible it is said, ‘Seek and you shall find,’ ‘Knock and the door shall open.’ So because he was seeking opportunities to serve, to love, even in the most traumatic situation, he understood that it was a blessing. Do you know where Vidura went? Here, he came to Haridwar which is just downstream from Rishikesh and there he met Maitreya Rishi, a great sage. Even though Vidura was a Mahatma, he was a paramhamsa; he was really a great personality. But actually enlightened people, they’re always looking for more enlightened people, because they want to humble themselves before somebody better. So actually Maitreya Rishi was not as advanced as Vidura spiritually, but he was very advanced, and Vidura just wanted to hear from someone. So he came and sat on the bank of the holy river Ganga, just near Rishikesh and Haridwar. And there are chapters and chapters in the great scriptures, of their discussion together. And while he was on this pilgrimage for many years, in completely transcendentally ananda or blissful state, Kurukshetra war happened, Bhagavad-Gita was spoken, Dhritarashtra’s children were vanquished, he lost everything and Yudhishtir was coroneted as king, which was his rightful position. Do you know what Vidura did? He left his pilgrimage; he went all the way back to Hastinapur because he knew that his brother was in real pain. Everything Vidura warned him what would happen, happened, and Vidura didn’t come back and say, “I told you so.” He forgave him and said, “It’s not too late. You were abusive, you were materialistic, you were envious, you were violent, you were hateful, even before Krishna, but it’s not too late. Come with me and I’ll show you how to perfect your life and have liberation.” He took Dhritarashtra to a holy place and Dhritarashtra was liberated. What are the qualities of a true yogi or sadhu? It is not whether you have long hair or no hair, it is not whether you wear saffron robes, or even if you have nice suit and tie or evening gown. The true quality is not based on external appearances; it’s our character. The true yogi is titishava, that means a person who is tolerant and forgiving, and karunaka, means merciful, kind and friendly to everyone, having no enmity toward anyone. Because even if somebody like Dhritarashtra is bad, we see the disease and we don’t hate the person. We feel compassion for that diseased person, because arrogance and envy and all these crazy things that happens from it, are only the symptoms of the disease. And we need to deal with them accordingly, because when a person is forgiving and a friend to everyone then he is compassionate, merciful. Shanta, person is really peaceful in any situation. If we have a strong spiritual foundation, even when the storms of life come, we remain stable; our integrity, our dignity, our character, and our peace and our compassion cannot be moved by circumstances, because it’s coming from something so deep and so real and from a place that is timeless, eternal. That’s the nature of the atma. Everyone is looking for ananda, it is within us. Yoga awakens it, uncovers it. Bhakti yoga, this beautiful chanting is the most powerful, simple, and pleasing way of awakening the love, the love for God that is within us. And as it awakens, we become empowered with compassion, because we really have nothing to fear anymore. The self is indestructible. Our greatest pain is to see others, our own brothers and sisters, everyone, and we are always forgetful of that. Rishikesh is a place since most ancient times and people have come specifically to reconnect with their own hearts, with their own souls. There’s an old saying in India that when a person is about to die, as a tradition they would say, “Are you going to Badrikashrma or Badrinath?”. And before people die they would come to the bank of the Ganga and go to the Himalayas to end their lives in a sacred place. 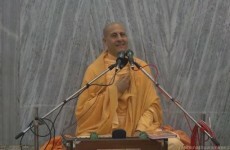 People go to Kashi, people go to Vrindavan, to these holy places to leave their body in this enlightened state of consciousness, but even better than that is to come here when we are young and get enlightened now, and become trained as teachers, and be equipped with knowledge and realization, and use our wonderful energy that we have to share this joy with the world.